Well hey there my 1 or 2 blog readers. I got this nice new iPhone and thought I’d try something. I’m going to live blog while I brew my Hot Chocolate Imperial Stout today. Should be entertaining. Anyway, here is my final recipe after many changes, tweaks and advice from fellow homebrewers and pro-brewers. I’ll let you know how it turns out. 9 am: Ok, slept in after a night on the town. Rolled out of bed & got the water going. While this 10 gallons gets to strike temp, I need to make coffee & breakfast. 10 am: Made coffee, ate something. I still haven’t mashed in. I was replacing a hose to my false bottom in my mashtun. Wasn’t paying attention to the water and I went over my temperature range. Now I have to wait for the temperature to go down by 10° before I can mash. Dammit. 11 am: Finally! After many trials and tribulations, a lot of adjustments and some spilled water, I have finally hit my mash temperature. Now I have an hour to get everything else ready while the starches convert to sugars. 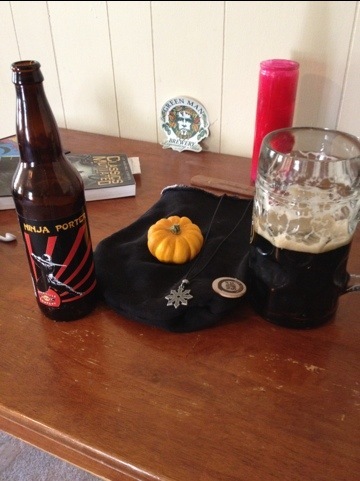 12 pm: A a friend of mine stop by to show me his hops. Very nice, smelly sticky & green. So distracted by the smelly goodness I forgot to get my Sparge water going in time. 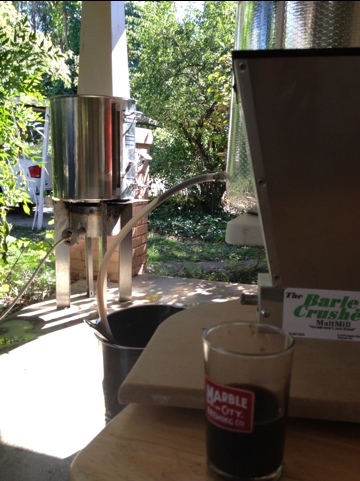 Right now I’m doing my vorlauf while my sparge water gets to 168°. I tasted the wort, definitely has conversion. Very sweet. 12:32 pm I’m sparging my grains. 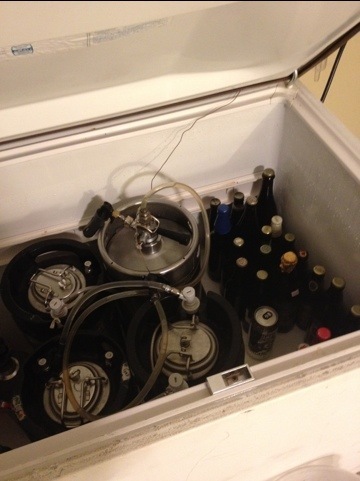 I need a homebrew. What should I drink? 12:59 pm almost up to boil. Then I’ll add first hop addition. Finally able to have a beer. 1:13 pm. I feel like I should be cleaning or prepping something. Got my hops ready, should hit boil soon. 1:26 pm: Ladies & gentlemen, we have boil! Added 3 ounces of locally grown, organic Williamette hops. 1:56 pm: I’m so hungry, but too busy to make lunch. I’ll pay you in beer if you bring me something to eat. 30 minutes left in the boil. I have to get all the cool down stuff rinsed & ready. 2:14 pm: Added another edition of hops. 15 minutes left in the boil. 2:45 pm: I ran out of propane the last 10 minutes of the boil! Luckily I live right next door to the gas station so I went to re-up on the propane, I got some ice for the cool down. Now I’m going to boil the bejesus out this wort for the next 10 minutes. 3:15 pm: My friend (who also happens to be my ex-wife) brought me lunch! Yay for food and friends! 3:45 pm: I haven’t updated for a while because I’ve been too busy. 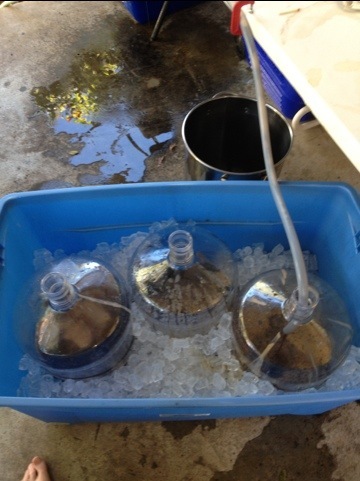 Right now I’m cooling down the wort. It’s coming out the chiller at a perfect 70°. I split it up between 3 six gallon carboys. I’m using the California ale yeast from Marble City Brewery, and I’m using a lot of it. 4:15 pm: I’m done brewing. The wort is awaiting the magic of fermentation… I’m going to take a break before I start my clean up. 5:15 pm: half way through my cleanup. Cleaning is my least favorite part of homebrewing. Almost done though and then I’ll go over to the comic book shop next door for little while for some quality reading. On the plus side though I did hit my gravity target with a OG 1.070. I am excited that the wort taste exactly like I want it to. Big flavorful chocolate smoothness balanced with hop bitterness. Then the spicy pepper taste gives you a hint of heat on the finish. I nailed this one. I can’t wait to try it after its fermented, conditioned and aged! 5:45 pm: I’m done. Well, except for a few more things I need to still clean. The wort is happily fermenting. I’ll put on air locks in a few hours. Thanks for tuning in to my live-blog-while-I-brew experiment. Do me a favor & leave a comment. I see by my site’s stats that a lot people have checked out this blog today. It would be good to hear from y’all even if it’s just to say hi. 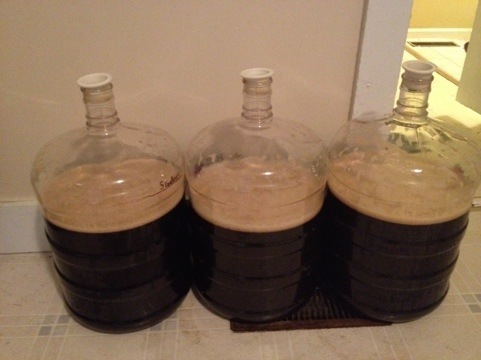 This entry was posted on Sunday, October 16th, 2011 at 13:04 and is filed under Beer, home brewing, Uncategorized. You can follow any responses to this entry through the RSS 2.0 feed. You can leave a response, or trackback from your own site. Thanks JJ for checking out my site! Cheers.